Colds are the most common form of illness known in adults and children. There are more than 200 viruses that can cause the common cold which are spread through hand contact, sneezing and coughing. Common symptoms include sore throat, headaches, coughing, sneezing, tiredness and a build up of mucus in the nose. Garlic is my winter wonder food!! It's amazing! 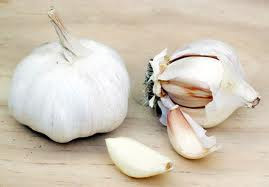 Whenever I feel a cold or flu coming on I either chew on a clove of garlic or cut it into fours and swallow it like tablets and within minutes my headache starts to fade, my nose clears and my throat stops hurting. I'm not making this up. During the 18th century gravediggers in France drank crushed garlic to reduce the risk of catching the plague and in both World Wars soldiers were given garlic to prevent gangrene. It is pretty cool stuff and its clinically proven to help with the common cold. A study done in the UK proved that taking a garlic supplement lowered the severity of cold and flu symptoms. Whilst a study done by the University of Florida concluded that garlic reduced the chances of an individual catching the common cold. So the next time you wake up with a blocked nose and sore throat think twice about reaching for those cold and flu tablets and try eating some garlic instead.